The New Jersey lunatic asylum was the original name for the building that is today known as Greystone park psychiatric hospital. 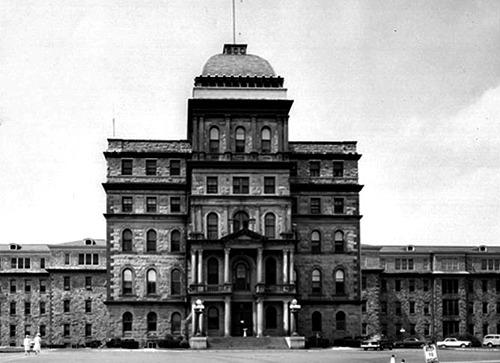 It was opened on August 17th, 1876 and was the second lunatic asylum in the state. The first asylum, located at Trenton was severely overcrowded so the 673,700 sq ft of space the new asylum offered was more than welcomed. The building had a capacity to hold 600 patients, and immediately after opening 292 patients were transferred from the facility at Trenton. From the day it opened it received a steady flow of patients who were being sent here from the surrounding population centres as well as Trenton, and so the facility soon became overcrowded. In 1887 the exercise room and attic were converted into more living quarters, and in 1901 a dormitory building was added to the back of the property. Even with later conversions and additions to deal with the growing number of patients the facility was still greatly overcrowded. In 1914 the facility housed 2412 patients even though it had a maximum capacity at the time of 1600. This problem only got worse with a recorded 7674 patients packed into the facility in the year of 1953. Pressure on the New Jersey lunatic asylum eased off in the 1970's and 80's and then on September 8th, 2005, a vast amount of money was given to the New Jersey Department of Human Services for a new facility. This is the hospital which is still in operation today and consists of 43 buildings spread over 1 square mile. Is the New Jersey lunatic asylum haunted? Most asylums that operated before the mid 1900's were definitely somewhere you didn't want to end up. Medicine was not understood then as it was today and treatments included things such as insulin shock therapy and electric shock treatments. With the centre being massively overcrowded for most of its life and with the understanding of mental illness being what it was in the day its fair to say that a good number of people died here. The centre was also one of the only facilities in the country that was equipped with dealing with the soldiers returning from the second world war who were suffering from shell shock. This would probably explain why people have claimed to have seen apparitions of uniformed soldiers as well as patients within the building. These sightings seem to be frequent enough to have gotten the site media attention for its ghostly goings on and has been featured in various newspapers and TV shows. The claims that people have made about this place are as varied as they are bold. There's all the usual things such as ghostly noises and strange cold spots, to the more extreme tales from people who claim they have actually been chased out the building by screaming ghosts.